What a great time we had last week! Your Minecraft Madness program did not disappoint! Children and adults alike thoroughly enjoyed themselves which we love to see! Our library has been fortunate to see several of your shows; each one different than the last but equally fun!! We look forward to your next visit! We just had Jungle Jim at our library and he was awesome!!!! We had 60 kids and 24 parents. He got everyone up and moving with non-stop laughing!!! He sent a letter for a culture grant, which made it so great for us. He is professional and organized and has a great personality! We are definitely having him back for many more shows!!! I agree with these reviews for Jungle Jim Manning. He creates programs that evolve from popular themes - example for this summer Minecraft Madness - and entertains a wide variety of ages. That is his greatest skill - his ability to keep everyone engaged. He gives lots of props to libraries and Friends throughout the performance. I recommend him, find him organized and easy to work with. He is an excellent communicator and it makes the planning process much easier. He provides a poster and a press release too! We had Jungle Jim (Minecraft Madness) for our summer reading kickoff this week and he was great! 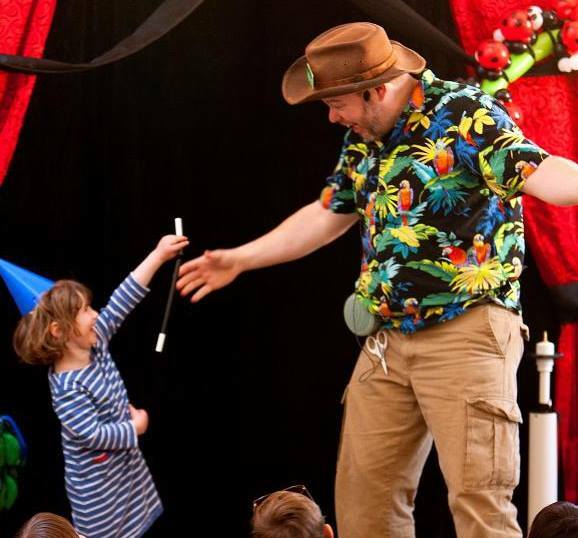 He combines balloon artistry, magic, comedy and improve to create an amazing experience for children and adults. He had everyone laughing throughout his performance. He wrote our cultural council grant, was pleasant and responsive. We will definitely have him back. On behalf of Young Men’s Library Association in Ware, I would like to thank you and Jim for making last night at our library so much fun. Jim was a pleasure to work with and our families had a great time. Many kids who saw him last year came back for more last night! High quality entertainment and sharing the importance and joy of reading are what Jim brought to the kids in such a sincere and energetic way. So, again, thank you for coming to our library. I will most definitely keep you mind for next year’s program! The Saluda County Library in S.C. really enjoyed having Jungle Jim do a summer program. There were around 200 people who attended and the adults and children very much enjoyed it! Jungle Jim had a lot of audience participation and kept everyone very involved and entertained throughout the program! Shout out for Jungle Jim! Admittedly, balloons and balloon humor make me very happy, so I'm already biased, but Jim rocks. I was giggling the whole time. First of all, he replied to my inquiry email almost immediately, he sent me an invoice on request, and he was in touch a few weeks before the performance and on the day of the performance. He arrived early to set up and was ready to greet our patrons with as much energy and enthusiasm as if he hadn't done other performances that day. We block booked with Rockland (THANK YOU ROCKLAND!). Not only that, we had our performance in temporary space that had NO Air Conditioning on a very muggy day and that did not seem to bug Jim. We also had our summer reading sign ups before and after the show, so he waited a few minutes for people to settle in after getting their reading materials-- i.e. he was totally cool working on "Scituate-Time." Highly recommend Jim for a high-energy, fun, and delightful treat! Jungle Jim’s Superhero Training program was a huge hit! The kids were entranced and even the adults were laughing. He offers lots of opportunities for audience participation, and builds in activities to let fidgety kids get on their feet and move around. He was highly professional and easy to work with, and we can’t thank him enough for the all-around great experience. My library was fortunate enough to have Jungle Jim perform his program, Super Hero Training, as part of our Summer Reading Program finale. Jim was very professional and extremely easy to get along with during set up and displayed his wonderful people skills during the show as he impressed children and parents alike. He came highly recommended and I couldn’t have been more pleased with his performance. He was able to be flexible with audience size and adjust his performance accordingly. I would be thrilled to have Jungle Jim back for another show. Words cannot express the excitement, humor, and valued family time that Jungle Jim exudes. Jim is wonderful with children of all ages, commands his audience with complete attention, and giggles and claps are heard throughout the entire show. We love Jungle Jim! Jungle Jim has performed at our library numerous times, and he's always a big hit! He utilizes tons of audience participation coupled with successful crowd management techniques, so kids have an awesome time without getting out of control. We've had him for both large and small groups of all ages and the programs have been nonstop fun and giggles. We booked 3 excellent performers during our 2015 summer reading program. Several patrons told our staff that "Jungle Jim's Superhero Training" was the most fun they had out of all of them. I wholeheartedly recommend Jim Manning and would not hesitate to book another one of his programs. We hosted Jungle Jim in Bedford for his Superhero Training program, and it was a fun, energetic event. He included lots of audience volunteer opportunities to go with the oodles of balloons, so no one left disappointed. Jim is thoroughly professional to work with, and we were delighted to have his program in the spotlight for our first week of Summer Reading. Jim is more fun than a barrel full of monkeys and has more energy and enthusiasm than all those monkeys put together! Kids and adults alike have a fabulous time at Jim's shows. We recently hosted Jungle Jim's 'Harry Potter Hogwarts Training Academy' program as our Summer Reading finale event. From the beginning, Jim was a delight to work with. With excellent communication, professional courtesy, and a kind, down-to-earth attitude, Jim was happy to help me book a program at the last minute. The enthusiasm and energy that he brings to his programs is infectious, and it is obvious that he truly enjoys what he does. The kids were bubbling with excitement during and after the show, while the adults enjoyed themselves as well. It's rare that I book repeat performers, but Jungle Jim is invited back anytime! Thank you so much for the Superhero Training we received here at the Mansfield Library! The children of Mansfield are now ready to take on the world. Our audience enjoyed the very interactive performance, and all of the balloon props and hi-jinks. It was a great family show! Your programs are very funny and are great for high energy kids. The program on Saturday was wonderful. Kids are still raving about it. You were great. We made the front page of the Claremont paper with a photo. Thank you so much for a wonderful show yesterday. Your program was very energetic and you really kept the crowd engaged. Nothing but positive reviews from all that attended. I’d love to have you back out again next summer.